Bangalore, December 8, 2014: Hettich India Pvt Ltd today unveiled a state-of-the-art Innovation Centre at Cubbon Road Bengaluru. 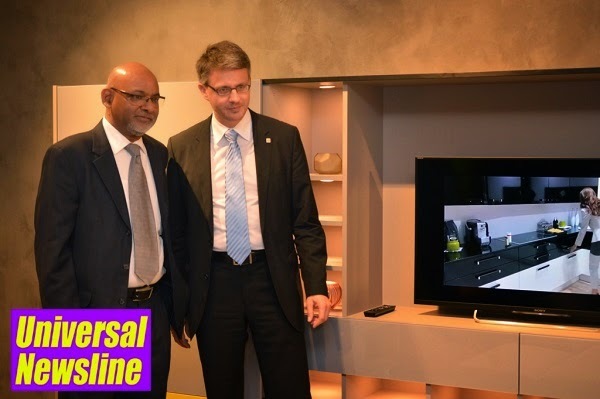 Launched by Dr Andreas Hettich, Chairman & Global CEO of Hettich and Mr Anil Goel, Managing Director, Hettich India Pvt Ltd, this innovation centre is the first of its kind in the world and will showcase the most premium products and applications from the Hettich portfolio. Hettich Innovation Centre will showcase the most premium fittings, products and their applications in modern furniture design to customers and designers with prior appointment for personalized attention. The Hettich Innovation Centre will also house a team of experts available for consultation on design services to customers and is aimed at giving a touch-and-feel experience to the consumer and to demonstrate the exciting possibilities that Hettich fittings offer. Along with the new centre, Hettich India has also beefed up their design services arm. The company now offers free design and hardware consultation for its customers at their doorstep, where their hardware engineers do on-site visits and offer customized solutions. Hettich is a German multinational with a turnover in excess of US$ 1 Billion & operations in over 100 countries through 38 subsidiaries. Production is carried out in sixteen state of the art manufacturing plants spread across Europe, Asia & America. Hettich’s product portfolio comprises of more than 18,000 fittings under the segments of Kitchen & Bath, Residential, Office, and Hospitality & Hospitals. Hettich India, its Indian subsidiary, is an undisputed market leader with an impressive growth rate and a pan India presence through a wide network of channel partners. Apart from the Hettich Innovation Centre, they also have display centers located at Delhi, Mumbai, Bangalore, Kolkata, Lucknow, Hyderabad and Chennai for architects, designers, contractors, OEMs, carpenters.